Help to keep your business details and company logo in every one's faces during this years Euro 2019 by having your details printed upon our Corporate Adelaide Contrast Euro 2019 T Shirts. 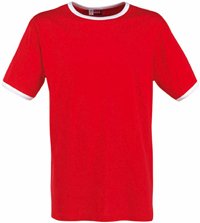 Our Corporate Adelaide Contrast Euro 2019 T Shirts are two tone T Shirts on the sleeves and collars and available in many colours including red-white, orange-white and navy-white to name just a few. Also our Corporate Adelaide Contrast Euro 2019 T Shirts will reach you ready printed up with your personal details and business logo to help you stay advertised. Then just give them away to as many people as you can. To find out more about our Corporate Adelaide Contrast Euro 2019 T Shirts click here and fill in the contact form and we'll get straight back to you. Other promotional and personalised items besides our Corporate Adelaide Contrast Euro 2019 T Shirts click here.